How does one go about diagnosing and assessing what is going on in the individual, team or organisation and what the real issues are? Any coach or consultant needs to get a sense of the organisation or client before being able to assess and to provide an intervention. They need to get a sense of the client’s (individual/team/organisation) self-concept, aspirations, view of the work, relationships, (explicit and implicit) challenges and leadership. Only in addressing issues that lie both above and below the surface will a coach or consultant be able to help a client identify appropriate actions that might effect real and meaningful change. 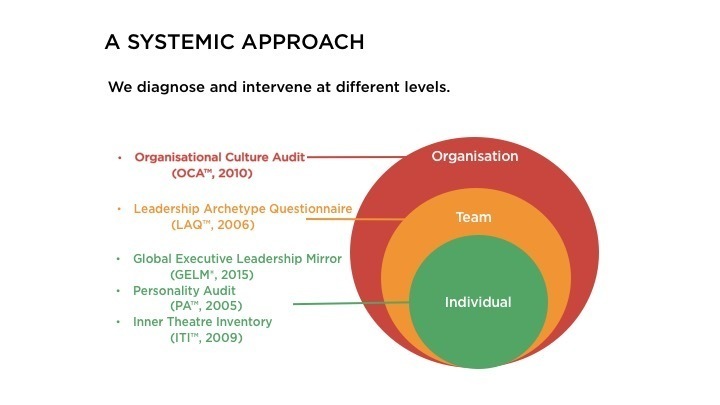 Consultants and coaches, as well as organisations themselves, need to develop a framework for systematic diagnosis to help them form an educated perspective, which they can continuously modify, so that they can reach an informed hypothesis of the leadership challenges they face. The framework can consist of a set of key factors and related questions that can help diagnose what’s going on at both levels, and serve as the initial analysis of the client/organisation’s strengths, aspirations, anxieties and defenses, and capability to change and to relate it to their performance. The results can be used to map it to the most appropriate approach when working with a specific profile as well as to craft and tailor specific approaches and interventions addressing the client’s explicit and implicit needs. Individual: To provide insights for a constructive dialogue about the way a leader functions and implicit and explicit behaviours that need further development. Team: To provide structure for team development initiatives by outlining the qualities, skills and competencies that leaders must have to be effective in teams, the roles they play and the way various roles complement or work against each other. Organisational: To provide guidance for strategic discussions that centre around corporate culture and to align values and behaviours to business strategy. Used together, these instruments provide a systematic approach to assessing leadership and organisational effectiveness. When conducted properly 360° feedback can serve as a powerful first step to jump start critical discussions and to create tipping points for personal and professional change.